After you’ve been blogging for a while, it’s easy to work yourself into a blog rut: always blogging about the same topics, feeling like there’s nothing you haven’t already said in one way or another. A blog rut can leave you feeling uninspired, like you are simply going through the motions. And your readers will sense that from you, too. So, how do you pull yourself out of that blog rut and get back on the road to success? Here are the five tips you need to ultimately understand how to blog better. Chances are, if you look back at your old posts, you can find one that you now totally disagree with. Or at least now see another side to. Share your new thoughts on this topic with your readers and why you changed your mind. I have an old post about how to deal with your child’s teacher that I could now argue against after a bad experience with one of my boy’s teachers. If you keep doing the same things in your daily offline life, you’ll have the same experiences to write about on your blog. So be adventurous and try something new. Consider getting out from behind the computer and attending a blog conference or even joining a local moms’ group. You just might find a hobby or a group of people that you love. Even if it’s an uncomfortable experience, it will give you something new to blog about! Kat from Mama’s Losin’ It and Kludgymom both have great resources for writing prompts. Whether you are looking for blog link ups that have themes or specific topics or a seemingly endless idea bank, you will never be at a loss for topics. Choose a prompt that is different from what you usually write about. Sometimes a prompt can help us remember something we totally forgot about but that would make an interesting story (you know, like that time there was a warrant out for my arrest). I’m not talking about the cardinal blogger sin of plagiarism: do not ever, ever do this. But you can ask someone else to guest post for you. You’ll give yourself a break from having to come up with a post and perhaps be inspired by their topic to write your own post. This last point might sound a little silly to you. After all, isn’t that what our blogs are? Where we share our stories? But chances are that you don’t always share all of you. And while I’m not suggesting you spill those private details that are better left offline, I am suggesting that you share something more about you. Sometimes we get so caught up in telling stories that relate to our blog topics that we forget that our readers don’t just care about our topic but about the person behind the blog. What are your tips for pulling yourself out of a blog rut? 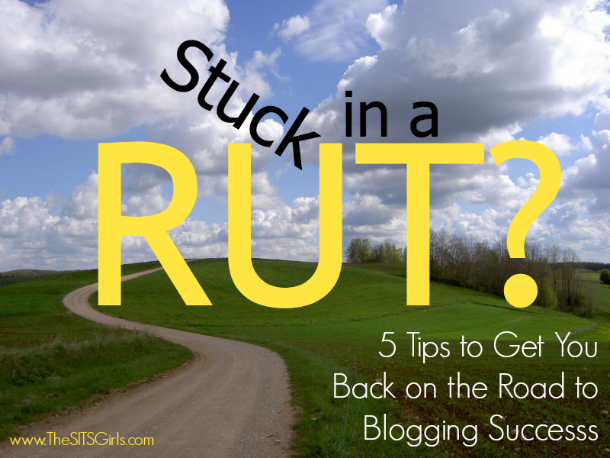 If you liked this post on pulling yourself out of a blogging rut, we have more! That’s why I wrote my post today. I am always looking for inspiration on my blog posts. Sometimes I write about one of my new listings, local real estate news, or local event / holiday. I like you idea of mixing up your routine, as well as arguing with your opinion of a previous post. These are unique ideas I have not heard of before. Thanks! Now I really think I can get out of the rut and back to a good routine, with blog posts going live 2-3 times a week again. Great tips and very timely too! I feel like I’ve fallen into a rut these past few weeks. I’m definitely going to try out some of these tips and see if I can get my mojo back! This is so me right now. I just got back from vacation and I just can’t seem to sit and put words in a post. I have so much to write about in my head but when it comes time to write I draw a blank. Hopefully these tips will help. I miss writing. Great tips! Some days I sit in front of my computer and just stare at it…the ideas just don’t come. I try to walk away and come back to it later so that I don’t get overly frustrated with myself. I also find it helpful to jot ideas down in my day to day life so that when I’m having “blogger’s block” I can look back at old ideas for inspiration for my posts. Great tips.very helpful tips that you shared. I have learned a lot from your blog. I love these tips, Shell! The guest posts really helped my blog when I was on vacation a week ago. Granted we came home early but I still let the posts run because it was only fair. After time away and time not focused on writing I came back refreshed and feeling much better. Another thing that has helped immensely is reading books. I didn’t read actual books for a long time but I’m slowly getting into the habit of reading more often. I’ve been able to generate several new ideas out of this. These are all great tips overall though. Several of them definitely come in handy when I get stuck in a writing rut. I love the idea of arguing with yourself. And I agree that doing something in real life really lets you get creative and helps new ideas flow. Even if it’s stepping away from the computer and enjoying a cup of coffee without a screen in your face. Some good tips there! Another one we found is to look at forums. What questions are people asking, what problems do they, and can you help? When you’re creating posts that help people it does seem to really motivate you. I’m sort of in a blog rut. It’s not that I don’t have anything to blog about, but I’m just tired of blogging. Has anyone else had this problem? I find that taking a break or this may sound silly, but a 3 minute Tabata workout with a favorite song turned up loud, is sure to get me energized and refreshed. I use an app for it and it just gives me a good mental break when the ideas aren’t flowing or I am not completely happy with how a post is flowing. Also, I like to look at blogs completely different than mine and see if there is a style or theme to something that I could put into action on my own blog. Thanks for this well needed and well written post! I have been in a bit of a blog rut for a good month now….not sure if Summer has slowed down my posts due to so many activities happening around me….but it could be that I need some new and renewed energy breathed into my Blog…so will definitely follow the guidelines above! I love this. Especially number 1. I share my opinions frequently on my blog, and I’ve often wondered what to do if I later change my mind. Thanks for the great tips! Someone gave me some great advice about rewording magazine articles, titles, or anything along that nature. It’s actually helped me write several of my posts. I really love number 2. It’s one of the great things about blogging: we have the perfect excuse to do really fun things in real life (not that we NEED an excuse) because it’s fodder for our writing/blogging. I’m currently doing number 3 by participating in August Break 2013. It’s a nice respite and I’m getting a lot of technical things done on the side. Good post! While I haven’t been blogging long enough to really get into a rut yet, I can definitely see how these tips apply to getting new fresh content. Thank you! I felt like I was getting into a blog rut awhile ago, but then summer happened, and I became re-inspired not just in a writing sense, but there has been so much happening lately that I have lots of material. I’m looking at older experiences that I can write about in a different way- before, I would just write about my travels from a food perspective, but I’m indulging the writer in me more and telling stories about individual travel circumstances. It’s so much fun! It does help when we have new things to do- plenty of blog fodder! Thanks Shell! I totally agree with doing something new in real life! My heart has really been nudging me to do that to be inspired to get out of my Blog Rut! Seriously this post could not have come at a better time! THANKS, SHELL!!! Seriously, couldn’t have come at a better time–I’ve been stuck in a blog rut for quite sometime now. I think getting out and trying new things or even just checking out some local prompts would definitely help with this. When I’m stuck in a blog rut, I always take a break from it. I walk away, do something else and just don’t think about it. I find that my best ideas come to me when I’m not sitting there trying to think of what to write (if that makes sense). For sure. Sitting there staring at my computer does me no good when I feel like that!